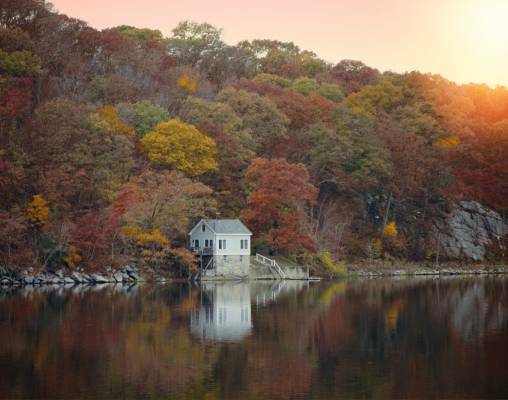 Watch as the warm hues of autumn overtake the landscape on this 8-day guided journey through New England. The tour begins as the group discovers the Colonial history of Boston. From Boston, we travel out of the city and into some of the best places for fall foliage viewing in all of the United States. The first stop is North Conway, where we will travel down the Kancamagus Highway and take a mid-day journey on the Conway Scenic Railroad. Next, it is a ride on the Mt. Washington Cog Railway. From there we head to Vermont where we board Amtrak’s Vermonter. In Mystic, we will visit the nation’s most impressive maritime museum, Mystic Seaport. Moving on, a Newport Mansion and all of the sites of Hyannis lie ahead. The group will enjoy one final train ride aboard the Cape Cod Central Railway before the journey concludes in Boston. 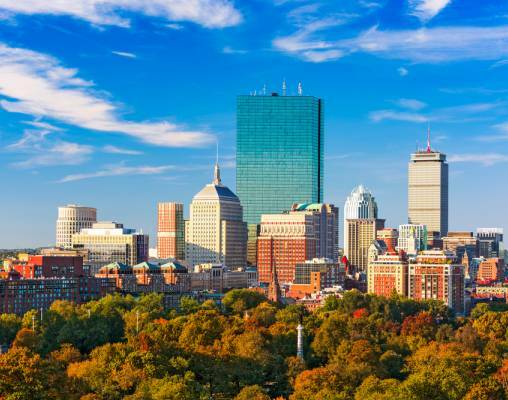 With dinners that immerse us in the culture of New England, amazing sightseeing opportunities and ample time to explore on your own, as well as with the group, this fall foliage adventure is second to none. Arrive in Boston and make your way to your downtown hotel on your own. You will have some time to settle into your accommodations or to begin your explorations of this historic city. This evening meet your Tour Manager and fellow travelers in the lobby of the hotel for an introductory meeting. Dinner is at leisure at one of the many fantastic eateries that call Boston home. Overnight Boston, MA. Hotels include DoubleTree by Hilton Hotel Boston-Downtown, Hampton Inn & Suites North Conway*, Hilton Garden Inn Burlington Downtown, Hilton Mystic, and Holiday Inn Cape Cod – Hyannis. 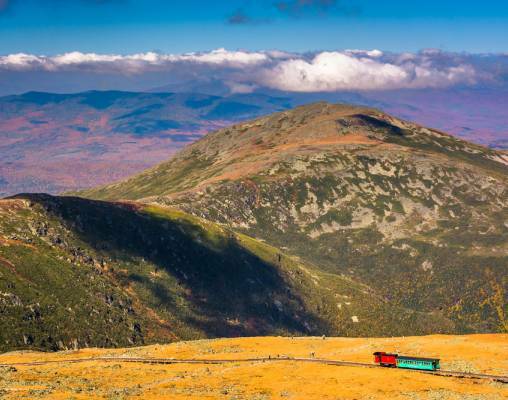 Operating on tracks that date back to 1870, the Conway Scenic Notch Train travels through some of the most dramatic scenery in the Northeast: bluffs, ravines, lakes, streams and lush forests. In operation for 150 years, the Mt. Washington Cog Railway was the first mountain-climbing cog railway in the world. The journey begins at the Marshfield Base Station and takes approximately 1 hour to reach the summit, where amazing views abound. The journeys both up and down the mountain are fully narrated, offering little-known facts and wonderful scenery. A daily train that runs between Washington, D.C. and northern Vermont, Amtrak’s Vermonter is your ticket to New England. The train makes stops in 9 states and the District of Columbia: Connecticut, Delaware, Maryland, Massachusetts, New Hampshire, New Jersey, New York, Pennsylvania and Vermont. Destinations along the way include resort towns, scenic destinations and popular commuter towns. 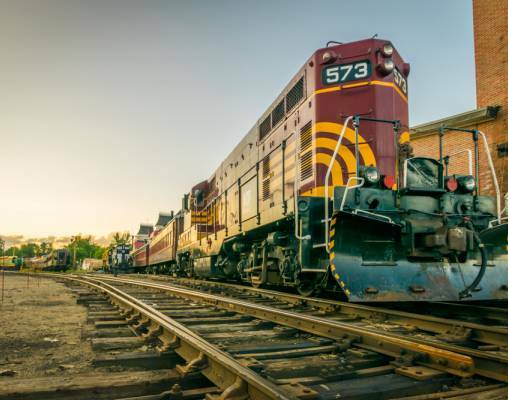 The Cape Cod Central Railroad follows a route from Hyannis to Buzzards Bay, which is approximately 27 miles in length and offers immaculate looks at the region’s shoreline. 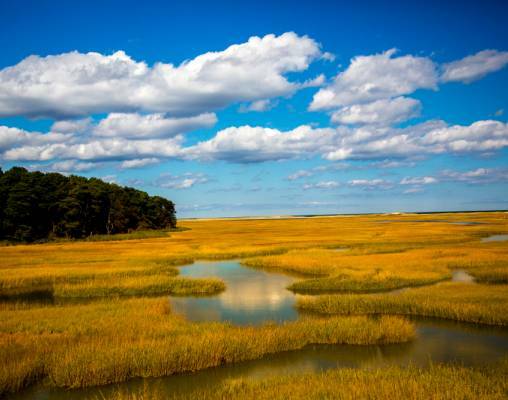 Passengers get a glimpse at the natural side of Cape Cod - the salt marshes and the cranberry bogs, the sand dunes and beautiful shorelines. There are a total of 6 engines in operation for the railway, all of which offer interesting routes and unforgettable views. 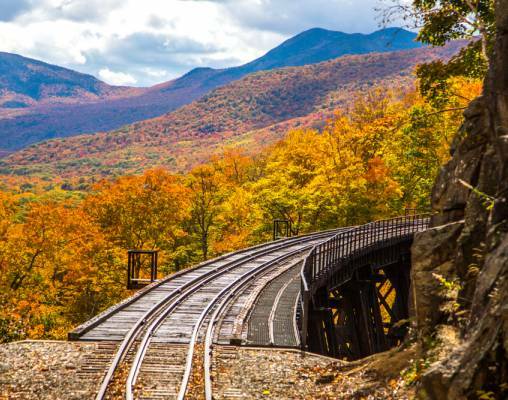 Enter your details below if you would like to be notified when 2020 dates and prices are available for New England’s Autumn Foliage Express.